This isn’t an actual image, just an artists impression I put together. I always find it helps to visualise these things; it helps me understand a system if i can see it. So this image depicts everything I currently know about the Elias 1 system. I hasten to add that this is not a definite depiction either. The image is simply based on hypotheses I’ve read, and the current most likely scenario. The stars are Elias 1 itself (the bright central blue-ish star) and it’s close binary companion star (estimated about one and a half times as big as the Sun). The third star in the system, a red dwarf, is shown in the bottom right of the image. It’s quite distant (over 500 astronomical units) and there doesn’t seem to be much available data about it. It’s fair to assume though, that it may have a circumstellar disk, or even planets, of it’s own. Surrounding the star is a reddish circumstellar disk, rich in carbon. Here be diamonds. The disk is “clumpy”, and I’d speculate that planets are probably forming within. The blue projection from the star’s North and South poles is a bipolar outflow, rich in polycyclic aromatic hydrocarbons (PAHs). The wispyness surrounding is the star’s light illuminating the surrounding nebula. An envelope of dust and ices tenuously surrounds the whole system. Looking at it this way, it seems logical to assume that those PAHs are being created from diamonds that stray too close to the star and pyrolyse. 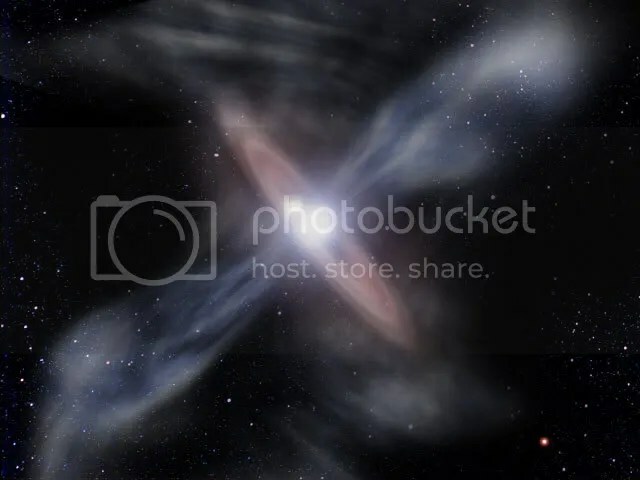 The remaining carbon fragments would then presumably combine with hydrogen from the star’s corona and subsequently be ejected in the bipolar outflow. The interesting part is how those diamonds came to be there in the first place. This entry was posted in astronomy, Imported from Livejournal and tagged polycyclic aromatic hydrocarbons, stars. Bookmark the permalink.